Last May housing activists obstructed over a dozen buses ferrying tech workers in the Mission District of San Francisco. Their weapon of choice were e-scooters, a proclamation that shared scooters are treated better than the city’s homeless. With yellow signs in hand and a makeshift barricade constructed, the protesters grasped their phones and tweeted #techsploitation and #scootergate in what seemed like self-aware irony. Many were quick to deliver cyber blows to any polar views. It’s no wonder many tech workers are now self-conscious of their tech swag as the industry’s reputation continues to decline. This is the path of resistance we follow. When protesters take to the streets, we also take to the screens. Meanwhile, an undercurrent of research indicates that technology augments hostility. The online disinhibition effect. The road rage you unleash within the confines of your car; translated to the shield of your smartphone. When we use technology we dislike as a tool to fight technology we loath. The natural next step would be joining the techno-moral panic. Tech is the culprit of our cataclysm, the cause of endless evictions; we passionately update our Facebook statuses to tell the world. Political divides ignited, our screens beget pedestals to rant within our respective choirs, and bifurcate from whom we oppose. But what if—rather than succumbing to hatred of the other—technology can be used as a tool to moderate perspectives? What happens when we use technology to manipulate our own environment for good? That’s the central question behind Deborah Slater Dance Theater & John Fesenko’s new work, In Civility Pt. 2: Outrage Machine, as part of Combustible Residency 2018 at CounterPulse. Intersecting art & technology is not unfamiliar territory for Fesenko. At Yerba Buena Center for the Arts, he worked on Synaptic Motion, a Jodi Lomask/Capacitor work that borrowed Fesenko’s neuroscience background to create a psychosomatic 3D virtual reality flythrough. Slater embraces creative technology as an opportunity to work with someone who is supposedly an enemy as a model for sharing space. “Knowing the other part of the equation in a battle always changes your relationship to the other person,” she explains of her collaboration with software engineer John Fesenko. Audiences may conclude their work is another attempt of SF’s art cannon to shed light on tech’s gentrifying forces. But in Outrage Machine, the technology carries consciousness. One that opens a window toward human awareness through Slater’s poetic dramaturgy. Rather than cause=effect installations typical of most creative tech works, Fesenko is creating an immersive 3D volume enabled with sensors. 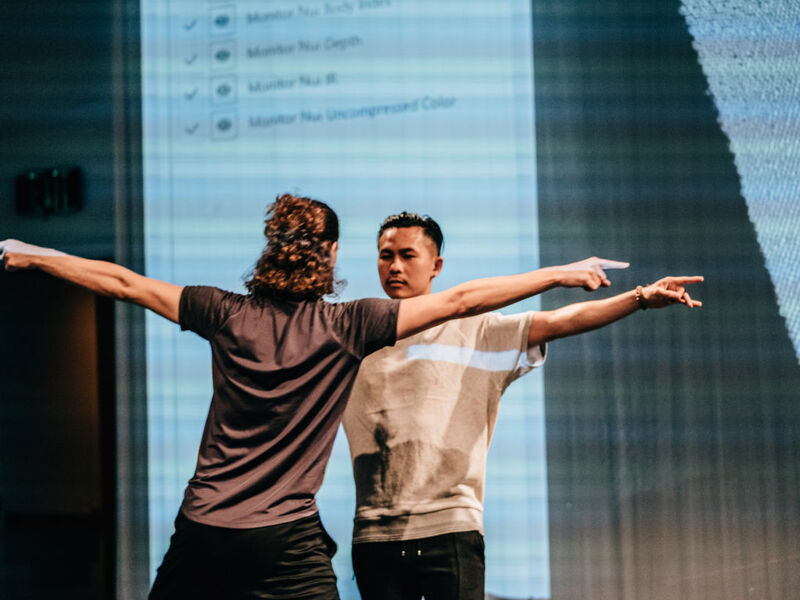 The effect: Technology moves beyond the stage and breathes life into the dance vocabulary and washes into the audience. 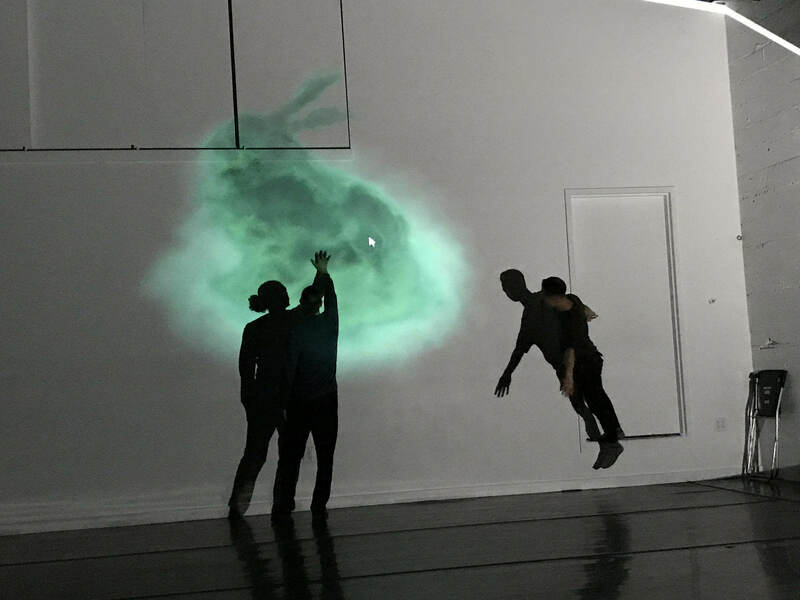 A work-in-progress of Outrage Machine illustrates the performers moving with colored projections in organic unison, as if Fesenko wrote his code to function as another choreographer. Indeed, as the residency progressed, Outrage Machine took surprising directions. 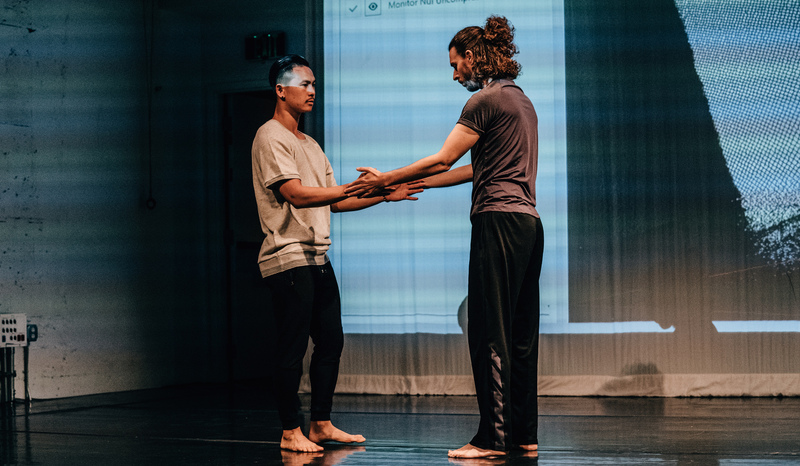 Initially the work scripted both performers—Hien Huynh and Derrick Harris—as walking to a protest together only to discover they’re rallying on opposite sides of the protest. Thereafter, the battle lives through their screens. But personal histories shaped the narrative arc more than technology could. While Huynh’s family was fleeing Vietnam in the 1970’s, Harris’s father was an American soldier stationed in Vietnam. “There is an amazing correspondence to them historically. In Hien’s case, his family has not talked much about their history, and he’s now asking them questions,” remarks Slater. Personal stories morphed into rehearsals as both performers brought their perspectives to the work. “Watching the dancers evolve emotionally in the rehearsals has been quite striking,” observes Fesenko. The dancers succumb to their primal animalistic selves, battling within the depths of their limbic systems as accessed via screens. The tension is violent and one wonders how much personal catharsis is unleashed in the quarrel. 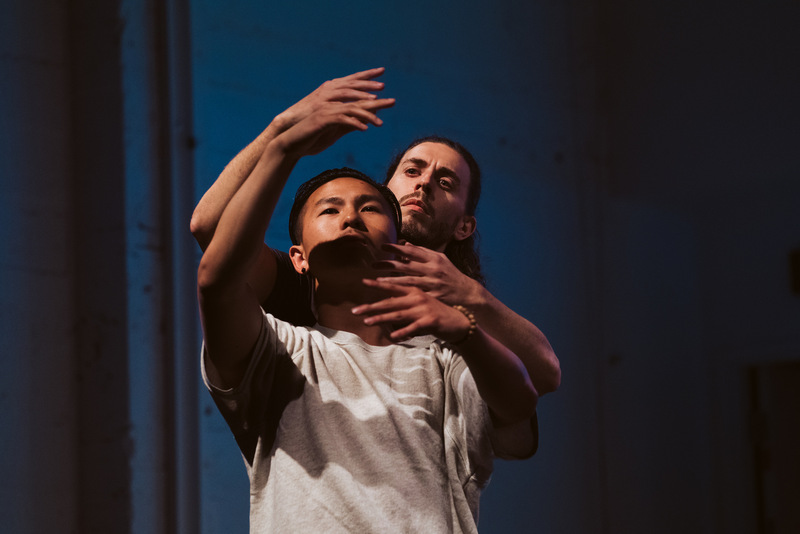 In this sequence, we see Huynh and Harris mirror each others’ movement, a recognition of shared humanity. As each performer struggles just to survive the battle, there is something close to empathy that begins to resonate. “Sometimes that intimacy of fighting someone can be very revealing,” Fesenko declares. Are we supposed to translate the performers’ conciliation as a lesson to our political divides? As artist/activists, should we celebrate the tech industry’s successes? To Fesenko and Slater, Outrage Machine does not attempt to reach false conclusions, but rather, translate to a more sophisticated understanding of other perspectives. “It’s important to have evolution in the face of this constant barrage of incivility in order to indicate that there’s some hope,” Fesenko remarks. Such hope, in the larger tech industry, could be a product of social resistance and the use of the very technology that activists protest. The ever-increasing pressure on the tech industry —advanced via Twitter and organizing online—to take social action is resulting in calls for progressive tax measures to fund homelessness and tech businesses to improve their social footprint. In lieu of Fesenko’s coding, what happens when we operate outside the expected bounds of our scripts, when our movement is no longer traced by the technology that follows us? Can we enter our innate primal psyches in search of greater truth? What happens when we can’t hashtag the fight? It would be too optimistic to conclude tech workers and activists are seeing eye to eye, but if there’s anything that Slater and Fesenko suggest, along with the creative technology discourse at large, is that our struggle is vital for shared space, and eventual social transformation. In Civility Pt. 2: Outrage Machine premieres Thu-Sat, Sept 13-22 as part of CounterPulse’s Combustible Residency performance showcase.